2016 is here and we have updated www.linqto.me to give you even more functionality when managing your favorites and notes directly in the cloud. With version 7.0 of www.linqto.me, you can choose the landing page (home page) that you will be redirected to once you authenticate onto the platform. Up to version 7.0 of www.linqto.me, if you authenticated with your user account onto the system, you were redirected to the authenticated users landing page. This page that gave you summary of how many bookmarks, notes, folders, … had created in the system under your account. Moreover, if you had opted for a persistent authentication, by clicking the 'Remember me' checkbox during the login process, on your next visit to www.linqto.me as an authenticated user, you would have come in on the public home page. From this page you could have reached the 'authenticated user landing page' by clicking on the 'My Content' button. You can also reach this configuration page by clicking on the 'My Profile' button on any of the pages once you have logged in, then clicking on the 'Configure Dashboard' ( ) button. On the lower half of the configuration page, you will see information on the settings for the system home (landing) page, which you will be routed to once you have logged in, or if you come back to www.linqto.me from another site and you are already logged in. Nothing: this was the default behavior of the system before version 7 of www.linqto.me. Once you logged into the system, you were taken to the authenticated user landing page, page which would give you a summary of all bookmarks, notes, folders, … that you had created in the cloud. If you were coming back to www.linqto.me from another site, and you were already logged into the system, you would get to the public home page of www.linqto.me. User Home: if you choose this option, the system will take you to the authenticated user landing page, which shows you the summary of all items that you have created with www.linqto.me each time you log into the system (which was the case before as well). It will also redirect you to this same page if you are returning to www.linqto.me from another site and you have already logged into the system – this would be equivalent to arriving on the public home page and then clicking the 'My Content' button. Dashboard: will take you to the dashboard of www.linqto.me, page that will show a collection of all the bookmarks you have recently visited or created. As with the option of the 'User Home', when you log into the system, you will be taken directly to the Dashboard. If you are returning to www.linqto.me from another website, and you are already logged in, you will also be taken to the Dashboard without the need for any other clicks on your side. 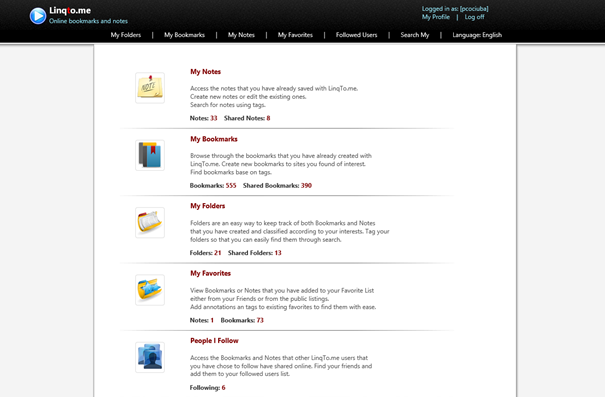 We hope this feature allows you to access your bookmarks faster and speeds up your usage of www.linqto.me. I've been surfing online more than three hours today, yet I never found any interesting article like yours. It is pretty worth enough for me. Personally, if all site owners and bloggers made good content as you did, the internet will be a lot more useful than ever before.